Braillo Braille vs. "Solenoid Braille"
The importance of a uniform braille dot is so important to blind readers that every major country has standards for the size and spacing of braille embossed on paper. To meet these standards, Braillo braille embossers use a highly effective embossing process unique to Braillo. We use a powerful press (paper shoes) which locks the embossing pins into position before a magnet triggers each pin to be mechanically pressed into the paper using a powerful dedicated motor. Every Braillo is built with 168 embossing pins (180 for SW and SF), which means each pin has a singular purpose to create a braille dot on a single column. All other competing embossers use solenoids. Solenoids send electricity through a thin copper coil to draw and fire a slug into paper to make a braille dot. This coil is highly susceptible to variations in the electrical charges, which means the braille pin is fired at different strengths producing inconsistent dot heights and shapes. Most competitors use only 6 solenoids to try and perform the same workload as our 168 (or 180) dedicated and perfectly positioned embossing pins. In a production setting, embossing at high speeds creates heat, which affects electrical charges in these solenoids. The result is their inability to braille fast and consistently, causing poor braille output. Furthermore, these heat issues result in frequent machine cool down periods, down time and worn out parts. Braillo adheres to nearly every national braille height standard, while our competitors simply cannot. Perhaps the most important aspect of quality braille that is often overlooked is dot placement. For the reader to understand what each dot represents, the dot needs to rigidly conform to an alignment of columns and rows, so that tactile patterns are recognized. 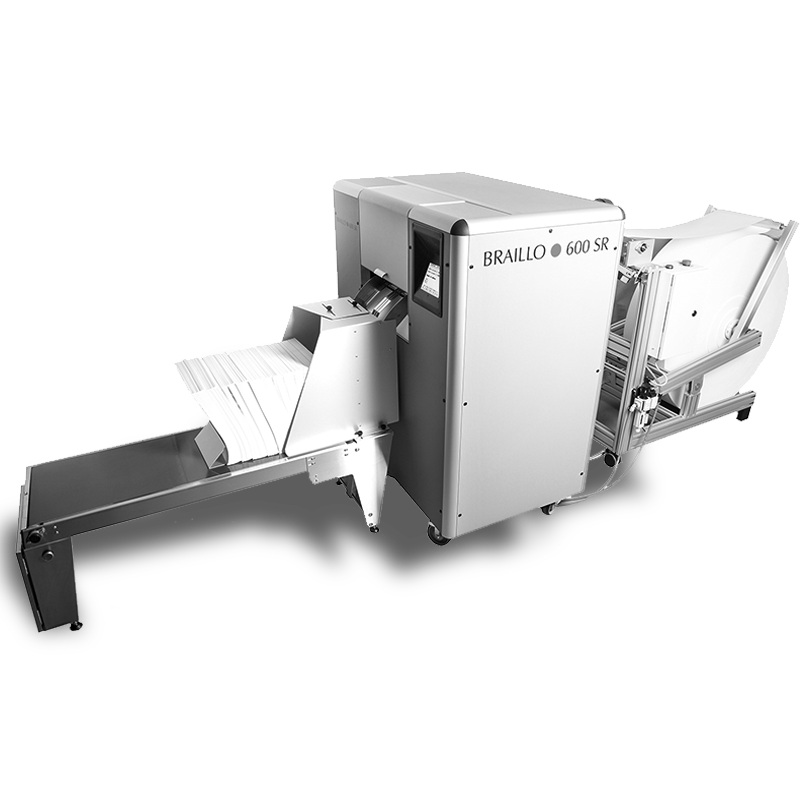 Braillo production embossers use 168 (or 180) complete embossing systems fixed into its embossing paper shoes, so they can emboss an entire line at one time. These fixed systems allow embossing of braille line-by-line, ensuring that the braille dots are aligned precisely with the required braille locations. This is not the case with solenoid-based embossers. Instead of 168 (or 180) embossing systems in a line, a solenoid embosser might use just a few solenoids to do all the work. To keep pace, these solenoids must move left/right and up/down on the page to place each and every dot. This amount of motion, heat and timing inevitably leads to failures in both dot height, shape and placement. There is simply no possible way that a solenoid carriage can precisely line up correctly line after line and page after page. The actual shape of a braille dot is what gives readers a fantastic tactile reading experience defined by clear reading and comfortable feel. The Braillo braille dot is engineered to have a crowning top with a slight ridge that gives a distinctly crisp feel, yet it is not pointy nor sharp. As you will learn, not only does Braillo have the best dot shape for reading, but due to the state of the art engineering discussed above, we are able to emboss this perfect braille shape over and over again. A production braille embosser makes millions of dots every hour and a Braillo embosser can continue this pace for 24 hours straight, day after day. The rigorous demands of production braille embossing not only requires the embossing heads to be efficient and strong, but it also requires the entire machine to be constructed of precision crafted parts made of high strength materials. 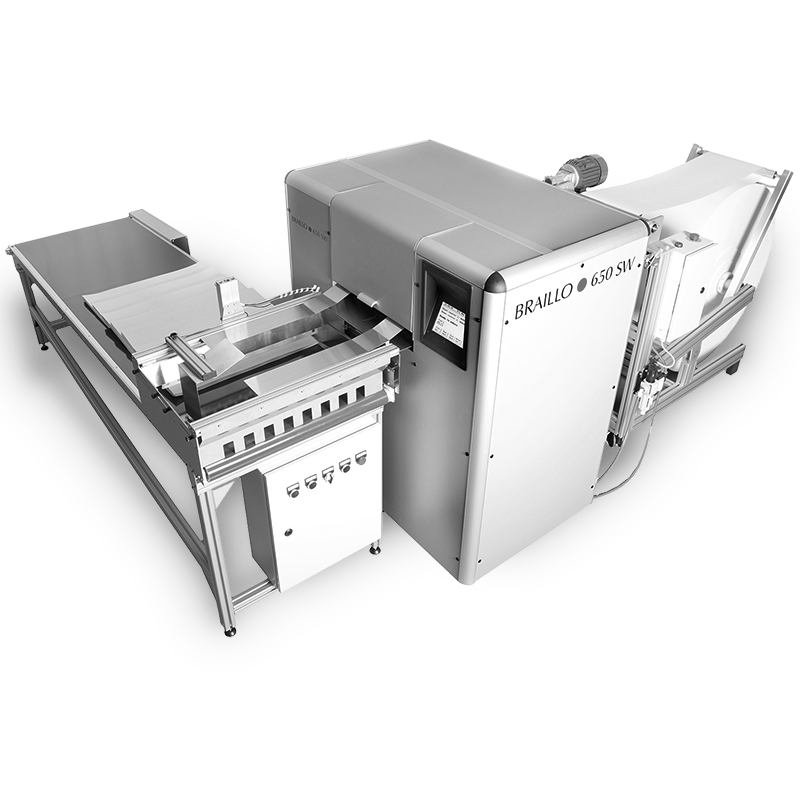 While Braillo embossers are built to last, our competitions solenoid-based embossers cannot hold up to the demands of a production grade Braillo embosser. 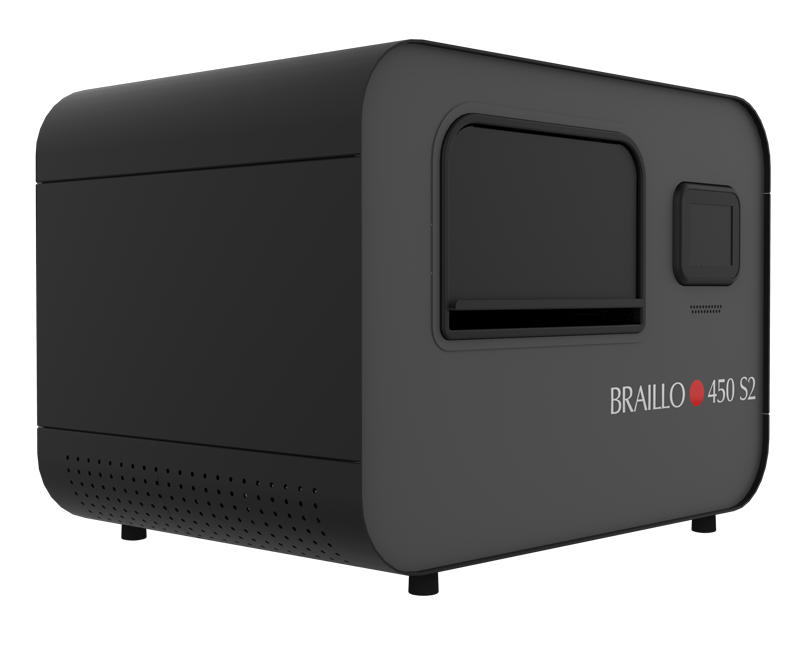 Take a look at the insides of a Braillo compared to our competitors and see the Braillo Difference for yourself – it is truly astounding – http://braillo.com/see-feel-braillo-difference/. Embosser speeds are usually given in CPS – Character Per Second, or PPH – Pages Per Hour. This should be straightforward, but some manufacturers are quite misleading when determining these speeds. PPH– The simplest and most deceiving method for getting extremely high PPH, would be to only run the Form Feed command and not send text. 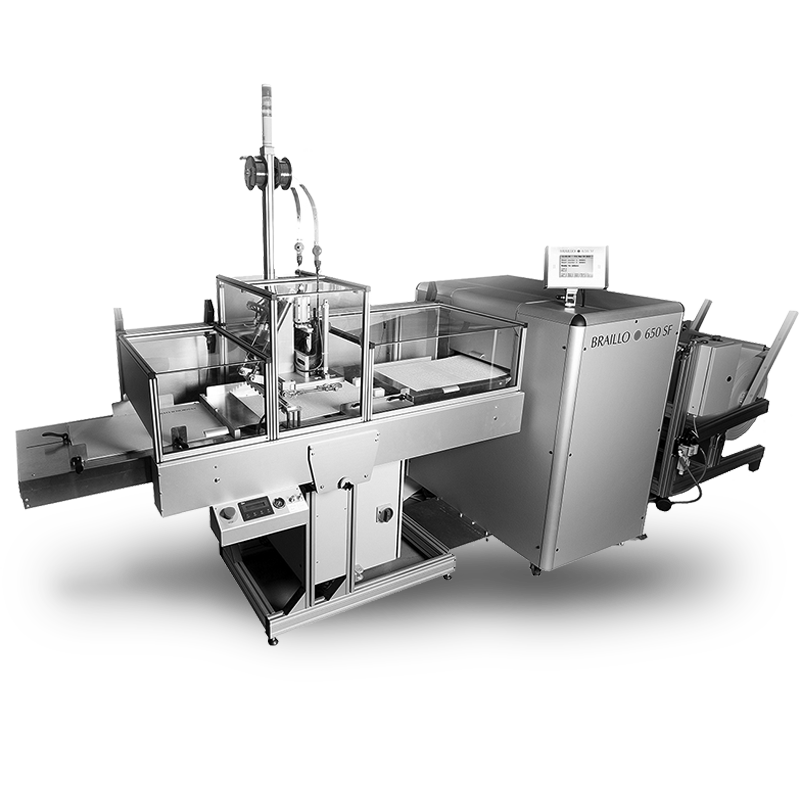 In this case, the embosser’s tractor-feed motor will operate at its top speed and churn out pages from the printer. Of course, there would be no braille on these pages, but the manufacturer could still boast a very high PPH. Similarly, shortening the amount of text on a page will also give a deceivingly higher PPH. 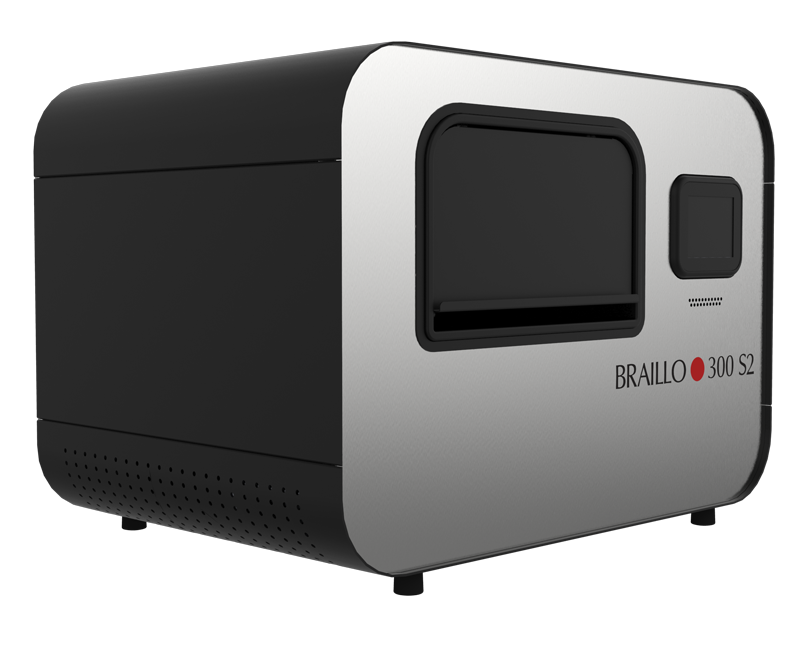 Braillo strongly encourages testing any embosser before purchasing, or seek references. But the letter “a” is made up of only one dot, and this too is considered a character. Using a speed of 300 CPS as an example, do you want a printer that can make 300 of the letter “a” per second? Probably not. For an embosser to truly have an embossing speed of 300 CPS, it needs to able to produce 300 Characters Per Second, and a character is a combination of 6 dots. So the embosser must be able to produce 300 character of 6 dots, or 1,800 braille dots per second. 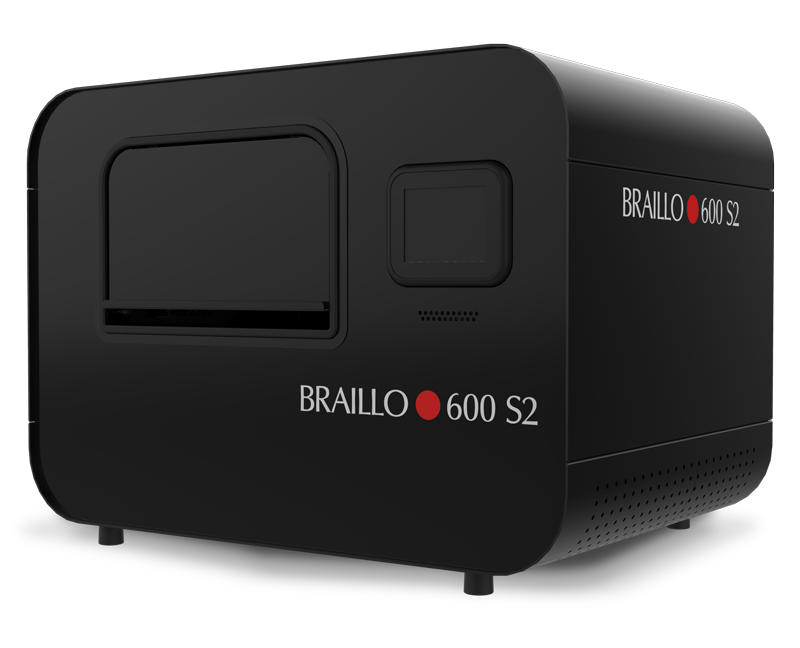 For Braillo’s slowest embosser, the 300 S2, to manage 1,800 dots per second, each of its 168 printing mechanisms must emboss a (1,800/168=) 10.71 rows of braille dots per second. Remember, a Braillo embosses a complete row of dots on both sides of the page, one line of dots at a time, in every cycle. So with frequency of 10.71 Hz, the 300 S2 can emboss 3.33 complete lines of 84 full braille cells every 3.57 seconds, or 299.88 CPS. Our competitor’s fastest embosser, claims a speed of 330 CPS, yet they use only 39 solenoids which are split in to 3 embosser heads. To emboss their claimed speed of 330 CPS or 1,980 braille dots per second, each of these 39 solenoids will need to emboss a dot and then the solenoid must move to the next dot’s correct location and emboss again at an incredible rate of (1,980/39=) 50.76 times per second! We encourage potential customers to confirm and seek clarification on this, as this is simply not possible. There is no such thing as a solenoid that can print millions of dots, have them align perfectly and never need to replaced – it’s impossible. Manufacturer’s should not be making these claims as they are not true and misleading to the prospective customer. Production braille publishing requires the level of engineering found only in a Braillo. The inexpensive construction of solenoid-based embossers, or having a combination of solenoid-based embossers in a larger “box”, is not suited to withstand the heavy demands of true braille production. Manufacturer’s specifications aside, look at the quality of the braille embosser, its components and ask for real customer references.